I will be postin the entire Cerberus sequence in Crozonia Issue 4 in full color! Special thanks to Dan Rivera for coloring it. Here is page 7, 11-13. 14 - 16 coming up soon! The Toronto Anime Con edition is on sale this weekend, limited to only 50 and only five bucks! Includes the short stories: The Escape, Phoenix Crystal part 1, and Phoenix Crystal part 2. The Phoenix Crystal part 1 was published in Europe in a magazine called Boy Zone, so this is the first time it is offered in North America. Part 2 has yet to see print overseas, so this is the first time, period! Crozonia #1 close to SELL OUT! I was doing an inventory check this weekend in order to ship to Diamond Distributors. After the Diamond shipping, there will be less than 150 copies of Crozonia #1! I have sold around 2800 copies of Crozonia #1. Not bad considering it's an indy book with very little distribution. I am considering a very limited edition 2nd printing on the color version of Crozonia #1. It's official! DMF Comics and Beach CS are producing the Storm Hawks comic book. More info to come! Just got the Diamond orders, and the numbers were quite low. Low enough that Diamond won't be distributing issues 2-4. Rest assured, Crozonia #1 will ship through Diamond on time in April. The rest of the Crozonia series will be offered through Haven Distributors. Thanks to everyone who has supported me so far. 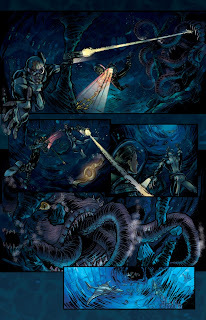 Another crazy page from the much anticipated Crozonia Issue #4! Coming this summer!